David Gell, Chief Strategy Officer at Olympus Sky, gave SBD an overview of their recent activities in automotive cybersecurity. Olympus Sky, a cyber security company focused on improving security for IoT and the automotive industry, is planning to be an exhibitor at ESCAR-USA 2016. SBD contacted Olympus Sky in order to gain insightful updates regarding their solution. Olympus Sky’s new approach to key management, ODSP, is a platform and cipher agnostic solution which eliminates certificate exchange, certificate processing and the exchange of bulk encryption keys. The result is a dramatic improvement in performance and an equally dramatic decrease in the cryptographic footprint. ODSP provides nearly instant, secure and resilient link establishment and a substantial drop in processing burden, both leading to significant reductions in the power consumption needed for IoT nodes. ODSP improves security by increasing encryption entropy and key rotation frequency without need for the exchange of shared secrets. 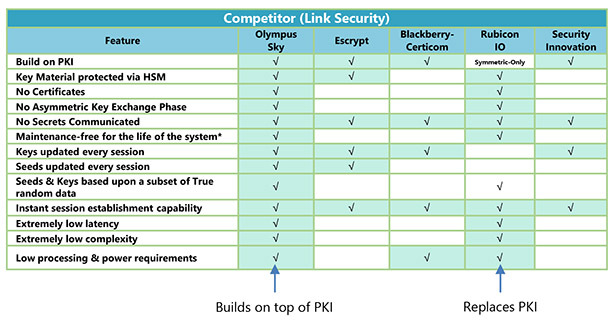 Unlike PKI, bulk encryption keys are uniquely derived for each session on each link. Furthermore, ODSP can detect and report on the occurrence of abnormal behaviour, providing an additional dimension of security. Mr. Gell is a technology executive and serial entrepreneur with over 20 years leadership success in mobile wireless, telecommunications and consumer electronics. He has held technical and leadership positions at HP, Ystopnow (co-founded), Solectek, Cygnus Broadband (co-founded) and WiLAN Labs. Mr. Gell has led teams responsible for developing and launching more than 30 products and platforms and has over 60 patents issued and pending. He received a BSEE degree from the University of Pennsylvania and an MSEE from Carnegie-Mellon University.